About a week ago, I noticed a new chart on my daily sales report on KDP: Paperback. 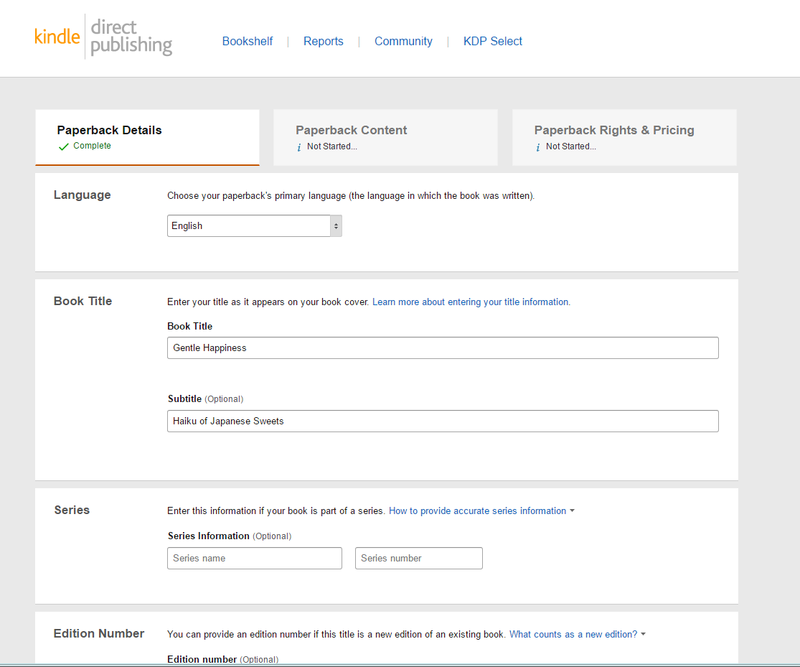 Turns out, Amazon decided to cannibalize its own print-on-demand branch, CreateSpace, and offer KDP authors an option to drop their books to paper straight from the KDP dashboard. 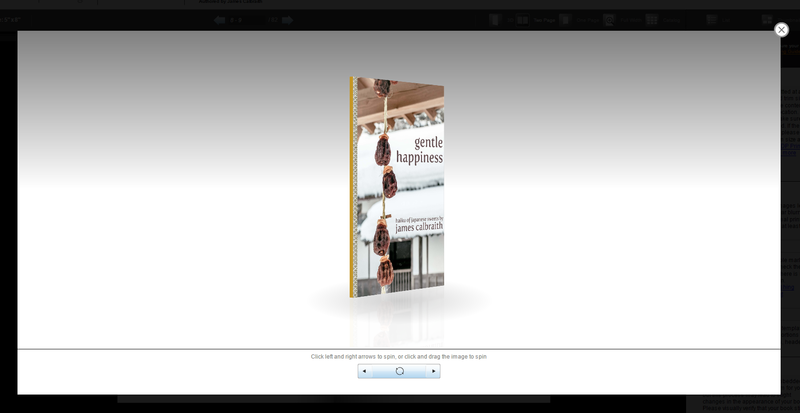 Starting out, the interface is a combination of KDP aesthetics and CreateSpace options. You’ve got your usual setup, already filled in with information from the ebook version. 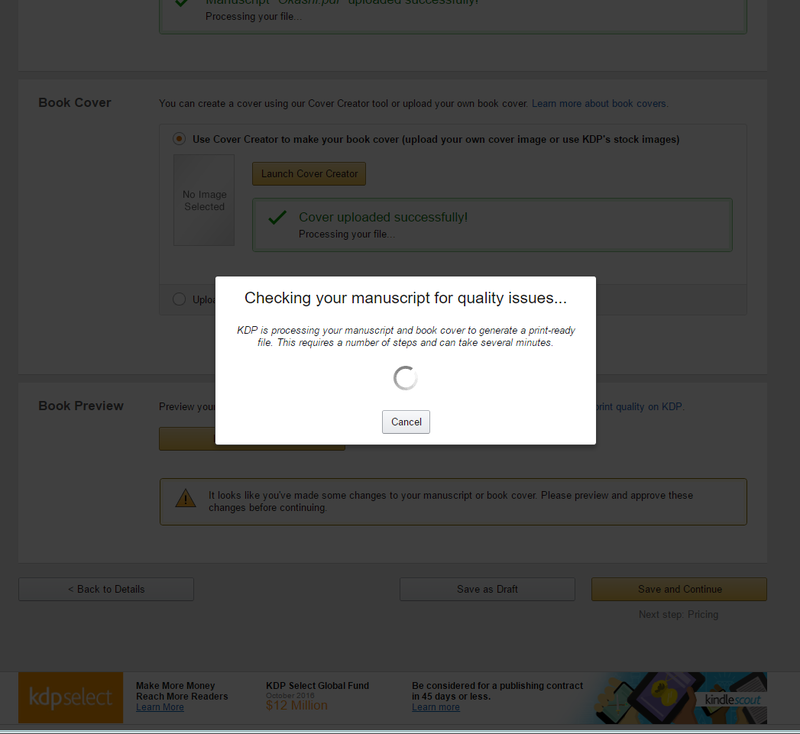 If you have the ebook all set up, there’s nothing for you to do here other than approve and click Save and Continue. 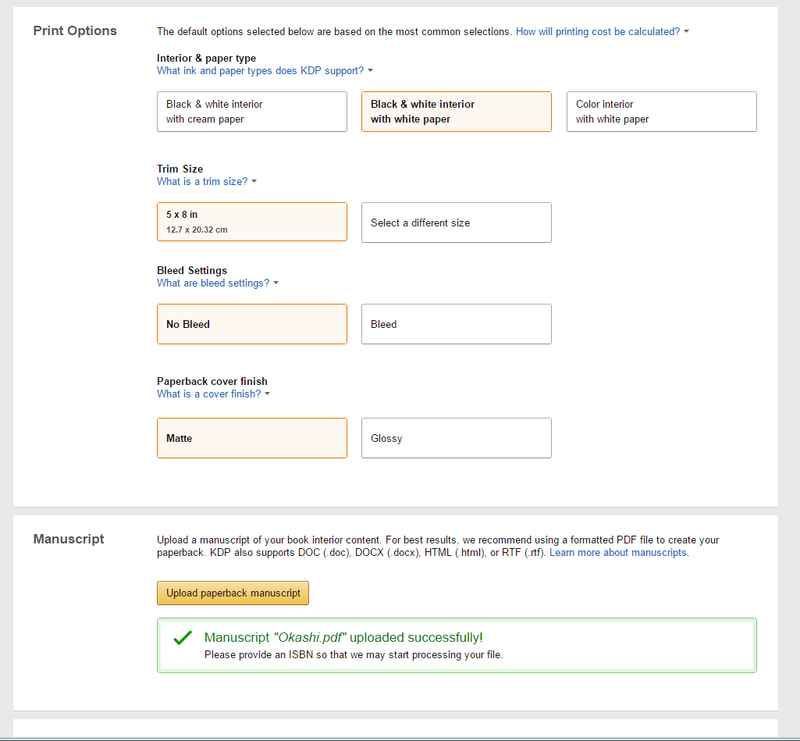 If you have the book already as paperback in CS, this screen is where you let Amazon know about it so they can automatically import all the paperback settings for you – although, as I said, at the moment there’s no incentive to do that. On the next page, if you haven’t imported CS settings, you’ll get a bunch of options to choose from. As far as I can tell, these all cost the same in print, except the difference in color and black & white. Here’s more pricing information from the help page – looks identical to CS prices. NB, at the top of the second page you can assign your own ISBN, or let Amazon assign it for you. From the second page, you can launch the Cover Creator if you don’t want to create the cover yourself. Again, standard CreateSpace fare. The selection of layouts and colors is limited – I certainly would advise creating your own image if cover quality is important for you. There are a few bugs here, too – for example, only on the second time I launched the creator did it tell me that the book is too narrow for the spine text – after I’ve already previewed and approved the book to print. I’m not sure what the final product of this would look like, and it’s a pity I wasn’t told beforehand, especially considering Amazon doesn’t offer free author copies like CS. 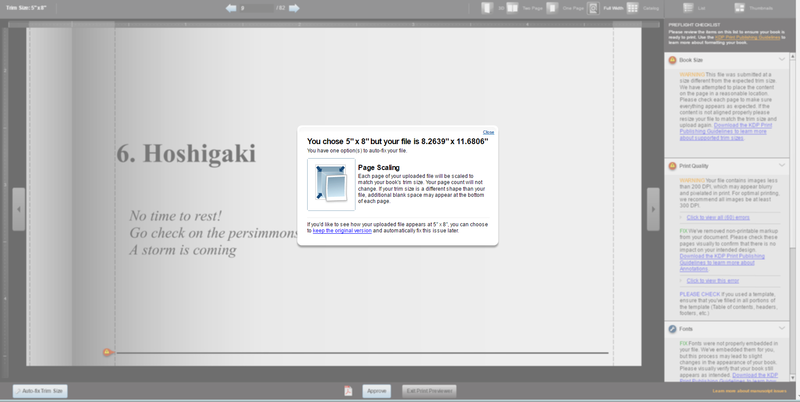 This is the screen you get after uploading the content PDF and cover, and approving everything to get to the next stage. For me this took a long time, even though the booklet is tiny. The editor found one major problem: the content PDF didn’t fit the print size. This threw me off a bit, since all I did was save doc as PDF from Word, without changing anything – I guess Word took my printer settings for PDF? Anyway, the editor fixed the scaling with a push of a button, and the rest of problems were not critical to the quality of the book (mostly having to do with DPI of images and embedding of fonts, neither of which was important for this experiment). The final page, as always, is the pricing. 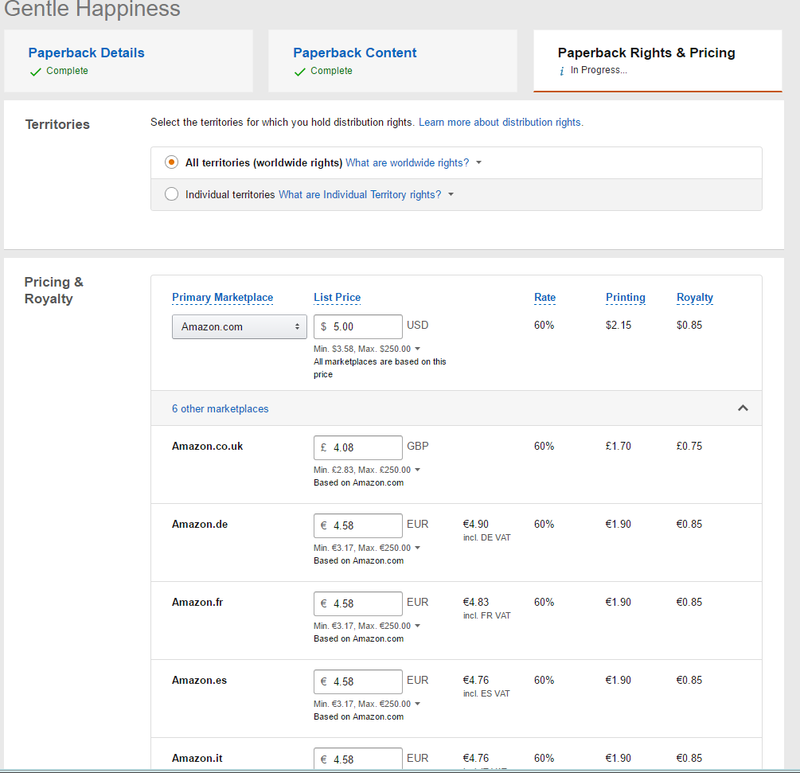 I thought the prices were better than CS at first, but no, CreateSpace offers exactly the same prices and royalties for its main distribution channel. Two versions of the same book. Unplusgood. Weirdly, Amazon is unable to automatically link the paperback and ebook versions, despite them both coming from the same source; same problem as on CreateSpace, but you’d think they fixed it for their in-house solution. I hope it’s just a matter of time, or of the service being in beta, otherwise it’s going to be a bit of a pain. If the two versions do get linked eventually, I’ll update this post to let you know. So there you have it – the KDP paperback. 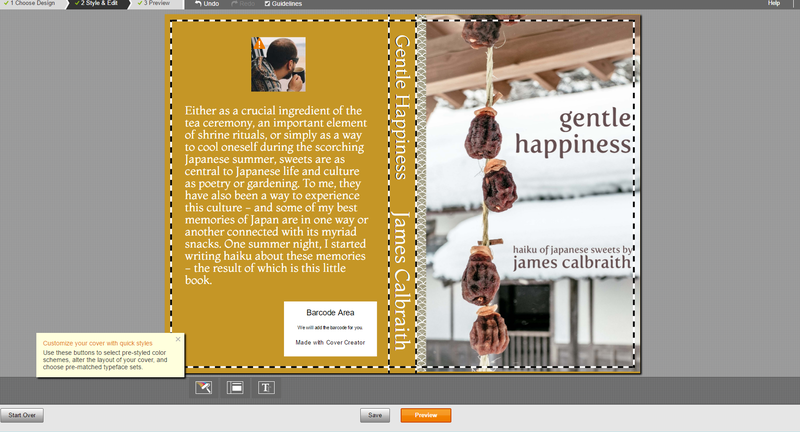 The setup is easy, especially if you’ve already did some work for CreateSpace version. 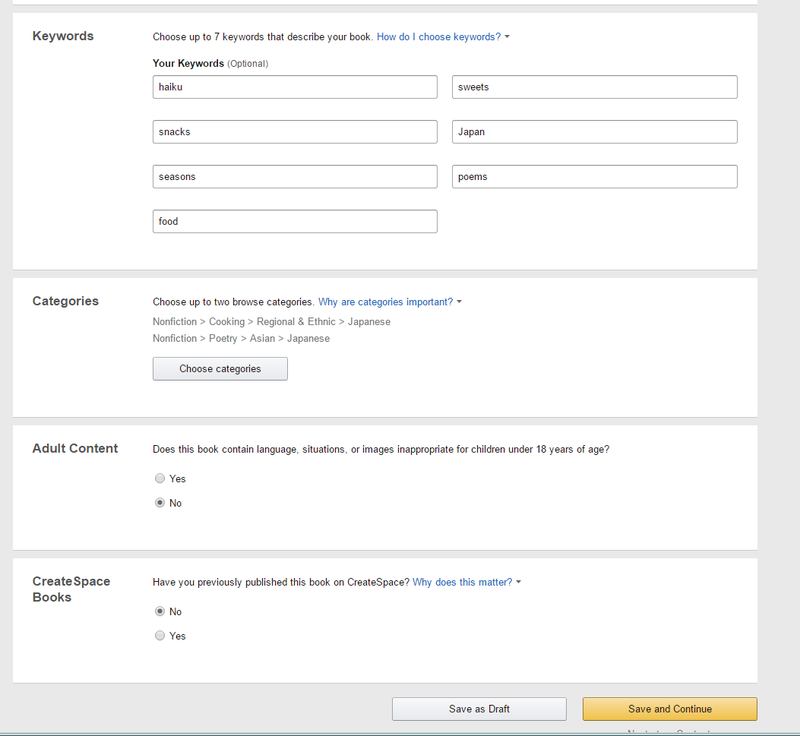 If you only care about selling paperbacks on Amazon, this is a valid option – but you get that from CreateSpace anyway, and you miss out on Extended Distribution. Amazon promises to add that, as well as proof and author copies, eventually – and once they do that, I guess KDP will replace CS as the go-to paperback solution, but for now that seems a long way away. After being available as a pre-order on Kindle, Book Seven of the Year of the Dragon, “The Shattering Waves”, is now available with all other e-book retailers. See links below for your favourite shop! It is the time of Darkness, as prophesied by the priests and soothsayers. Armies clash, cities burn. The sparks of hope are few and scattered. The Kiheitai, leaderless and purposeless after the disastrous Battle of Heian, flee to the harbour city of Naniwa. Hiding among them, Bran and Nagomi plot to release Sato from the clutches of the Serpent. In the South, Dylan, Gwen and Edern assist the rebel army marching against the Taikun, just as the Gorllewin dragon riders begin to have second thoughts about their alliance with the Fanged. And if you need to catch-up, “The Year of the Dragon, 1-4” is today only for a bargain $0.99! Now they’re in a book. This is probably my weirdest project to date. 70 haiku inspired by Japanese sweets and snacks, an effect of a sudden bout of creativity a few weekends ago. I haven’t written any poetry since that mad age when everyone thinks they’re a poet, so this was rather sudden. The main theme combines my two main pursuits in life – Japan and food 🙂 I added some personal notes to each haiku, then my wife made a few illustrations, and now the little book of poems is on Amazon, because hey, why not.